Each of the many monitors under my care at zoos and in my own collection has left me with the feeling that they are somehow “more complicated” than other reptiles. Recent research into their breeding and hunting strategies bears this out…monitors do indeed appear to be the most advanced of all lizards. Pets often become unusually responsive to their owners, who sometimes ascribe mammal-like qualities to these fascinating reptiles. Among the monitors we also find the world’s largest lizards, a fact which adds to their allure. But giants such as the Water, Lace, Crocodile and Nile Monitors are tough to manage even in zoos, and are suitable only for those few keepers with the knowledge, space, maturity and finances to meet their needs. More importantly, it must be understood that all monitors can inflict severe injuries…in fact, fatalities are a real possibility where young children or incapacitated adults are concerned. Today I’ll review some important points that, if considered beforehand, will greatly improve life for both monitor and monitor owner. As always, please be sure to post any questions or thoughts below. While monitors vary greatly in personality – some become rather docile, while others remain wary of people – all can be dangerous and must be treated with caution. They are certainly capable of learning from experience and altering their responses to people. My experiences in zoos with Crocodile and Water Monitors illustrated this very clearly to me (please see articles linked below). However, this should not lead us to “trust” them, or to treat a monitor, or any reptile, as though it were a well-trained dog. The following quote from legendary snake expert Bill Haast is generally applicable to any reptile: “You can have a snake for 30 years, but leave the cage open once, and it’s gone – and it won’t come back unless you have a mouse in your mouth”! Large species such as Crocodile, Water, Lace and Nile Monitors (V. salvadorii, V. salvator, V. varius and V. niloticus) can be dangerously aggressive and are not suitable for most private collections. In the course of my work as the Bronx Zoo’s head mammal keeper, I helped restrain giraffes, bison, polar bears, rhinos and many other formidable beasts…but Water Monitors are, pound-for-pound, one of the strongest animals I’ve ever handled. Large monitors can inflict severe bites and scratches, which can lead to permanent injuries and life-threatening infections. Operating policies in most zoos require that 2 experienced keepers be present when monitor exhibits are entered. Monitors are quite active, and languish in cramped enclosures. Also of concern is the fact small cages render it difficult to establish a temperature gradient (thermal gradients, critical to good health, allow reptiles to regulate their body temperature by moving between hot and cooler areas). Most species require very high basking temperatures, and if sufficient space is not provided, the entire cage will become over-heated due to the effects of the basking site. The 6 to 7 foot-long Nile, Lace, Crocodile and Water Monitors require room-sized enclosures with drainable pools. 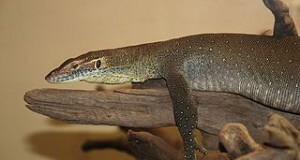 Even moderately-sized species, such as the Rough-Necked Monitor (V. rudicollis), should be provided with a living space measuring 6’ x 6’ x 6’ or greater. The initial purchase price of your pet and the expenses involved in constructing a custom-built enclosure are only a small portion of the total cost involved in monitor ownership. Electricity use will be substantial, veterinary care is as or more expensive than for a dog, and food (mainly rats and, for some, whole fishes) continues to climb in price. Reptile-experienced veterinarians are difficult to find in many regions, and not all will be willing or able to treat a large monitor. Trust me – it is a grave mistake to embark on monitor ownership before locating a veterinarian, or to imagine that even the hardiest of species will not require medical care. Please post below for a list of herp-experienced vets in your area. While all reptiles require daily checks as to their condition, many require very little in the way of actual daily or even weekly work. Large monitors need a great deal of care, usually on a daily basis…think more in terms of an annoying puppy (sorry, dog-people!) with dangerous teeth and claws rather than a well-fed, oft-fasting Ball Python. Remember also that monitors may live into their 20’s, and that the amount of work and degree of expertise they demand usually complicates the task of finding appropriate care while you are away from home. 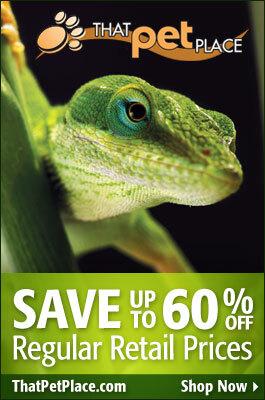 I always enjoy reading articles about my favorite lizards and this one hit right on the mark. 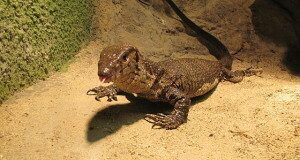 Right now I’m actually doing some research on the dwarf monitor species and plan on getting one in the future. I’ve also been told that the Bronx Zoo has or had kept Scrub/Amethystine pythons, M. amethistina. Have you ever worked with them or have any info regarding their care? They’re (the snakes and info) surprisingly hard to come by. I’ll be acquiring one in the next month or so from a breeder, one of only a handful of people I’ve found to have some for sale here in the US, and any additional material I could learn about them would be very much appreciated. Also, the ones he has aren’t the exact subspecies I’m looking for, would you by any chance know of other breeders or sellers of these beautiful snakes? I’ve been asking around as many people as I can these past few weeks but so far no luck. Thanks! I don’t know of any breeders…have had a number at the zoo, mainly confiscations, etc with no detail as to origin. All I’ve had were very aggressive, hard to exhibit except in huge room sized enclosures (fro adults). They tended to hide when possible;…most stayed high up in trees, out of view. males fought, once with fatal results…so…very interesting snakes, but they get so large and, while captive bred individuals may have a bit more potential as captives, I’d think carefully before obtaining one.